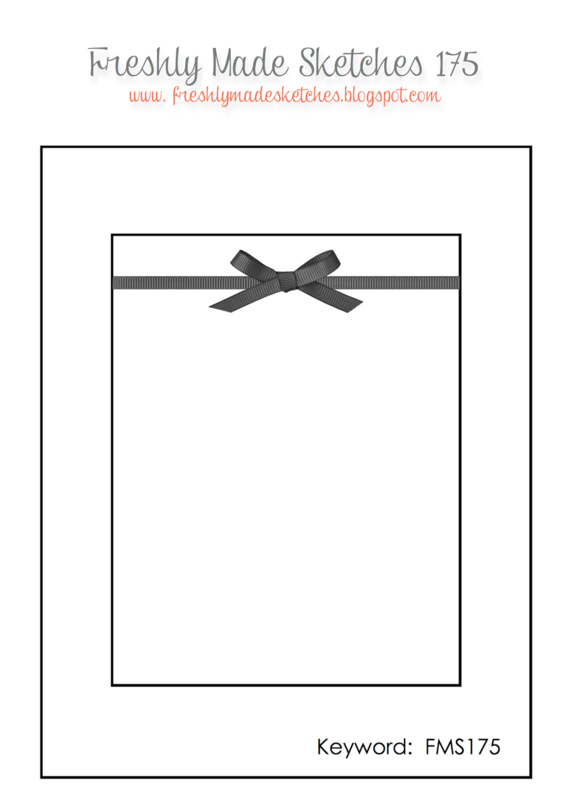 Here is the sketch – wow, talk about a clean slate, right?! Anyway – I wanted bright & cheery, so I used a card base of Calypso Coral, then layered designer series paper from the new Painted Blooms; I love the Crushed Curry stripes that look as if they were water coloured. Using the Ovals Framelits Dies and Big Shot, I die cut an oval in Whisper White card stock to use for my image base. I stamped the flower image from the Butterfly Basics stamp set in Smoky Slate, as I didn’t want a hard outline showing. To colour the leaves I used my Old Olive Blendabilities Markers; to colour the flowers I used my Calypso Coral ink and a Blender Pen. I added just a touch of Daffodil Delight Blendabilities in the very center of the largest flower. I wanted to create a bit more dimension to the image, so I took my Soft Sky Stampin’ Write Marker, and very lightly traced around the entire image. I then used a Sponge Dauber & Crushed Curry ink to sponge around the edges of the oval. I attached the stamped image to the DSP with Stampin’ Dimensionals. 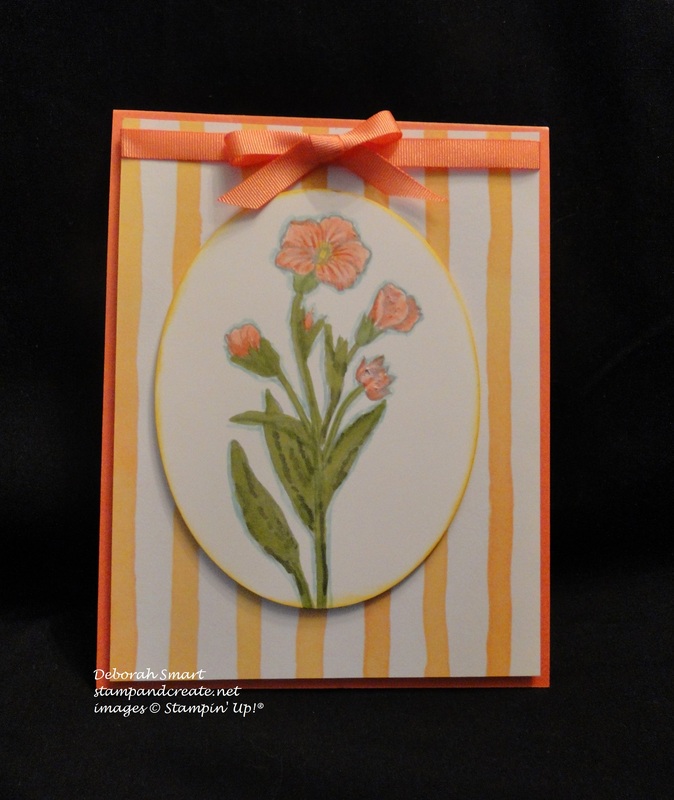 I used my FREE Calypso Coral ribbon – from the Best Year Ever Accessory Pack in the Sale-a-bration brochure – to finish off the top, and then attached the card base using more Dimensionals. 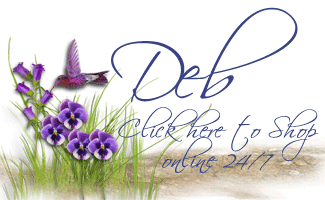 Thanks for visiting my blog today – if you have time to leave a comment, I always love to read what you’ve written! (I reply, as well!) If you have some free time, you should head on over to the Freshly Made Sketches page, and check out all the great submissions, as well as the design team cards – they’re awesome! Previous Previous post: Wacky Watercooler Blog Hop – Spring Fever! Next Next post: Fun with my Technique Junquies Club! I love the pretty Spring colors and the beautiful flowers. Thanks for joining us at Freshly Made Sketches this week! I’m trying to hurry Spring along, Amy! I hope it works, especially for my friends on the East Coast 🙂 Thanks for your kind comment – I’m really enjoying participating in the Freshly Made Sketches! This is so lovely! The coloring is fantastic on that gorgeous flower. Glad you joined us this week at FMS!